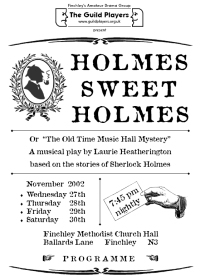 or "The Old Time Music Hall Mystery"
The Guild Players first performed this piece back in 1988, on the centenary of the appearance of the very first Sherlock Holmes story, "A Study in Scarlet". Fourteen years on and this revival coincides with both the centenary of Conan Doyle's knighthood and the publication of "The Hound of the Baskervilles" in The Strand Magazine. Last month Sherlock Holmes became the first fictional character to be awarded an honorary fellowship by The Royal Society of Chemistry for being the first detective to exploit chemical science as a means of solving crime. This play is itself a fiendish bit of alchemy, blending together elements of two Sherlock Holmes stories, mixing in a selection of period songs, and setting the result upon the stage of a Victorian Music Hall. The Guild Players tell me that they only do Pantomime once every two years. Their presentation of Laurie Heatherington's clever adaptation of two Conan Doyle short stories sometimes came very close to proving this not to be the case. Set in an Old Time Music Hall this was a production which had all the colour and music of pantomime close coupled with much of the smooth Victoriana which is essentially Conan Doyle. The actors therefore had to be very careful that they did not sink into a traditional over the top Panto style at the cost of losing Heatherington's very clever working of these two Sherlock Holmes stories. The performance I saw did seem to lack some of the pace which I might have expected from a Music Hall setting, and some of those I spoke to in the audience did feel that it was difficult to hear some of the dialogue. This aside, we had two hours very acceptable entertainment from a twenty-one strong Company that contained a wide variety of age range and ability levels. It was clear to me that this was a company of actors who were also singing, rather than a company of singers who were acting! With some thirty or so Music Hall songs, some well known, some adaptations to fit the plot, the four piece band led by Carole Clarke did well to keep proceedings on track. Words of some of the songs were printed in the programme, but seeing them in the darkened hall was something of a challenge. Not only did Laurie Heatherington write and direct the production, he also led from the front by taking the role of Music Hall Chairman. There were particularly strong performances from David Constable (Holmes); Mike Sparks (Watson); Judith Shrank (Mrs Hudson); and Jennifer Lewis (Kitty Winter). Good support came from Paul Sparks (King of Bohemia); newcomers Catherine Weaver (Irene Adler) and Kirsty Lincoln (Violet de Merville); and from Jill Brooksbank (Tillie) and Guild Players regular Nick Johnson (Godfrey Norton). The diffident dancing which accompanied some of the songs was rescued by Ari Gnanumuttu's (Shinwell Johnson) masterclass in Act 2. Where the production really almost lapsed Pantomime was with the baddies. Baron Gruner (Bill Davey); and his sidekicks Moriarty (Stewart Shrank); and Gorgiano (Beryl Cotton) could have been the Squire and Brokers men from any Panto you care to mention. Sherlock Holmes band of Baker Street Irregulars were played by Lynda Gordon; Victoria Ferri; Tej Agheda; and Vikki Harris. Other members of the cast were Sally Martin and Anne Hefford. The excellent costumes by Jenny and Irene Sparks added to a good evening's entertainment from a Company which is confident enough to ring the changes in it's productions.